As the only two official competitors in this racing contest, it's safe to assume these runners figured it'd be one of them who'd come out ahead in the end. They were wrong. Turns out, an adorable new challenger would decide to join in — and give them both a run for their money. The amusing incident reportedly took place at Chile's National Athletics Competition last year. 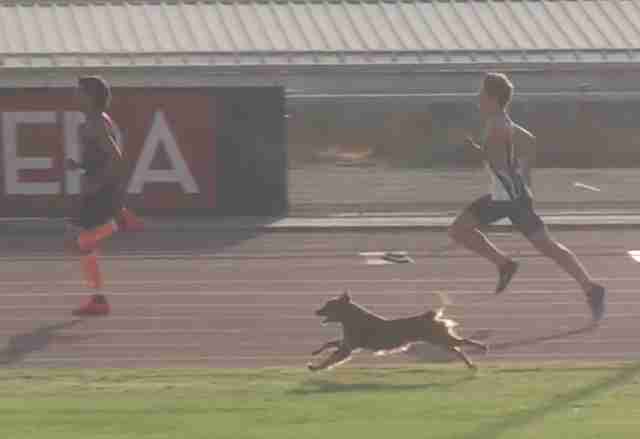 Not long after the starting gun fired for the head-to-head 400-meter dash event, a random dog appeared on the track alongside the two sprinters, clearly eager to show off his speed. It's unclear where exactly the pup had come from or how long he may have been preparing for that moment. But there's no doubt about the fact he'd blown the other runners away. Granted, being an unofficial entrant, the record books likely don't show the dog as the victor that day — but all his new admirers, gushing in the stands, certainly know the truth.